These are photographs of the three main pyramids on the Giza Plateau, which is called the the Giza Necropolis. This place lies on the outskirts of Cairo in Egypt. These ancient monuments comprise of three pyramid complexes (Great Pyramids) as well as the huge sculpture of the Great Sphinx. This complex also houses some cemeteries, a small village and an industrial complex. 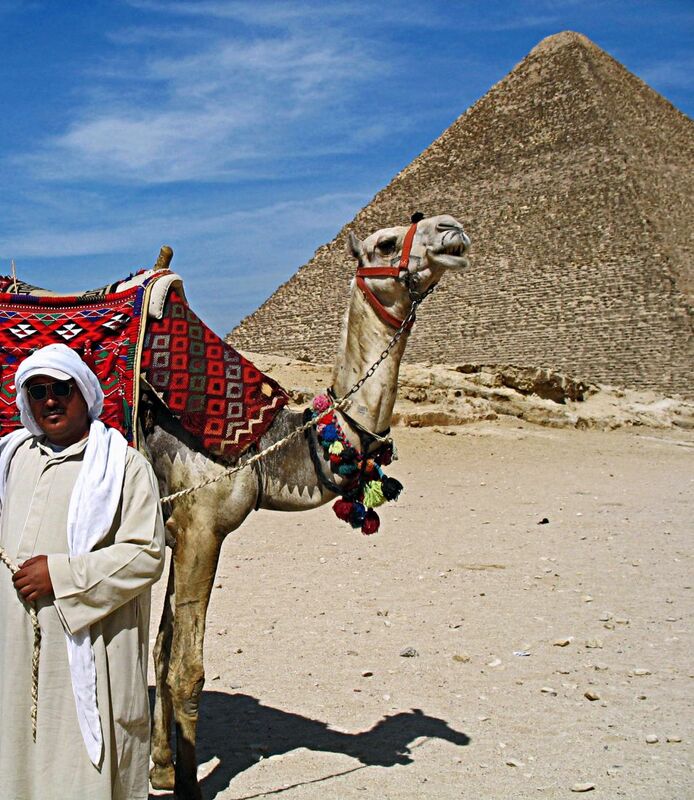 These pyramids were one of the ancient Wonders of the World. The first photo is of all the pyramids together against a deep blue sky. The Great Pyramid (the Pyramid of Cheops or Khufu) is to the right of the photograph, the smaller Pyramid of Khafre (or Chephren, Cheop's son) is in the centre, and the smallest Pyramid of Menkaure (or Mykerinos) is at a distance to the left of the image. This is the smallest pyramid on the Giza Plateau. Menkaure's pyramid is a tomb of the fourth dynasty Egyptian Pharaoh Menkaure. The Pyramid was once 218 feet but is now just 204 ft tall. The Sphinx can be seen as well. 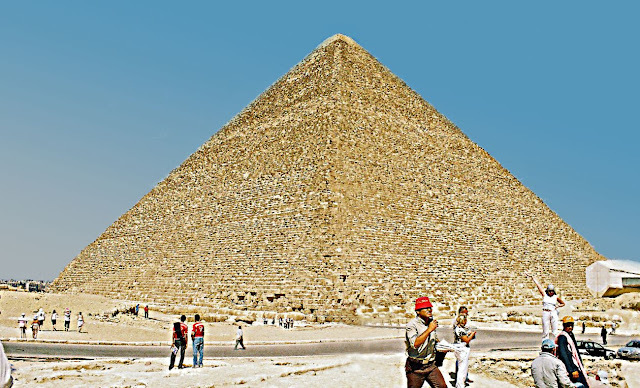 This photograph is of the Great Pyramid of Giza (or the Pyramid of Cheops or Khufu). 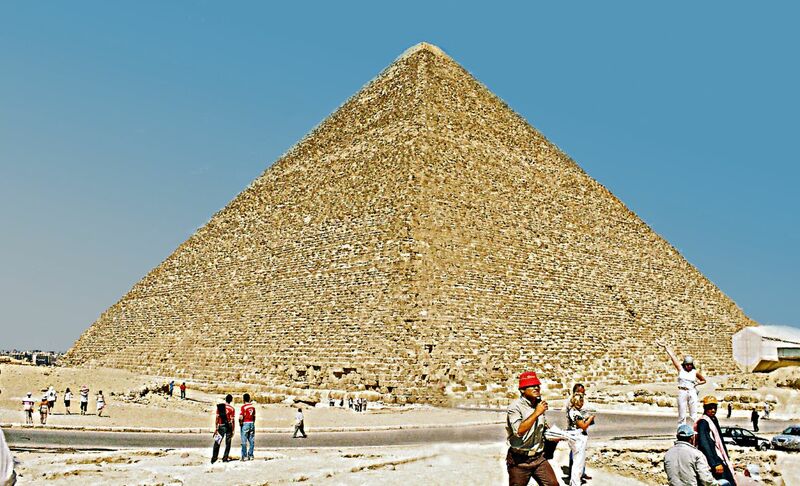 This is the oldest and largest of the three pyramids and one of the wonders of the world. 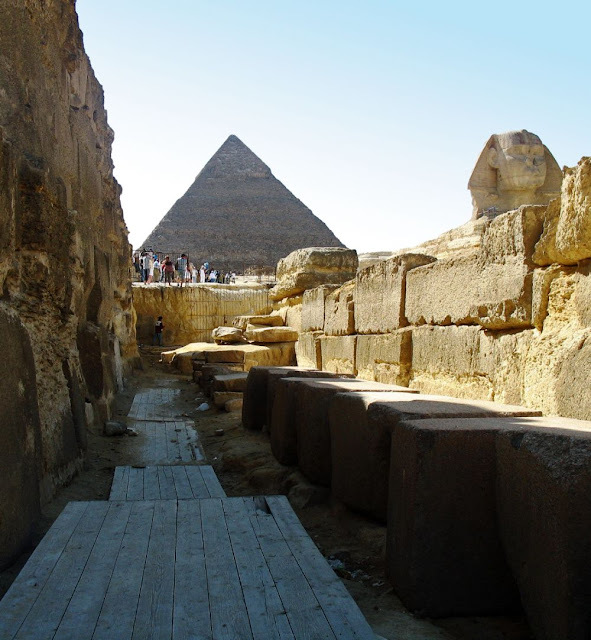 The pyramid was a tomb for the fourth dynasty Egyptian Pharaoh Khufu (or Cheops in Greek). 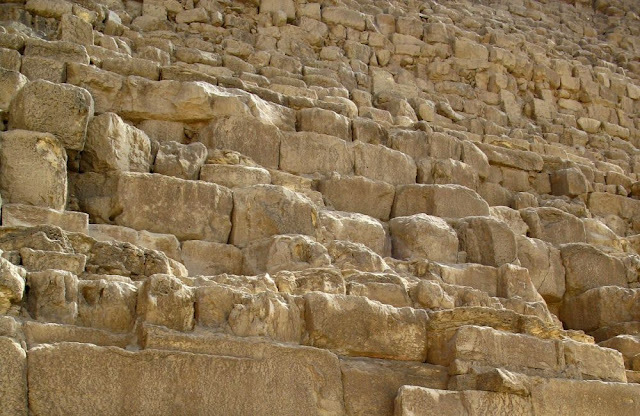 The pyramid was built over two decades and was finished around 2560 BC. It was built at a height of 146.5 metres or 480.6 ft and was the tallest man-made structure in the world for almost 4000 years! You can see tiny figures of people at the bottom of the pyramid which gives you an idea of the enormous height of this pyramid. The outer layer of casing stones has been eroded away. This is a view of Khafre's Pyramid and the Great Pyramid alongwith the Sphinx at dusk. The Sphinx is said to have the head of Khafre. 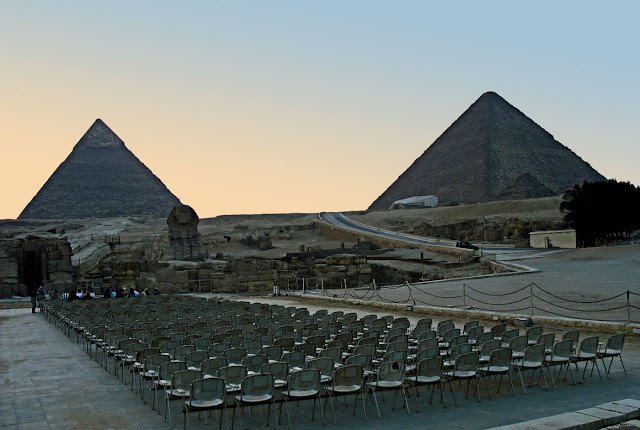 The chairs that have been laid out in front of the pyramids are for the Sound and Light show which is about to begin. 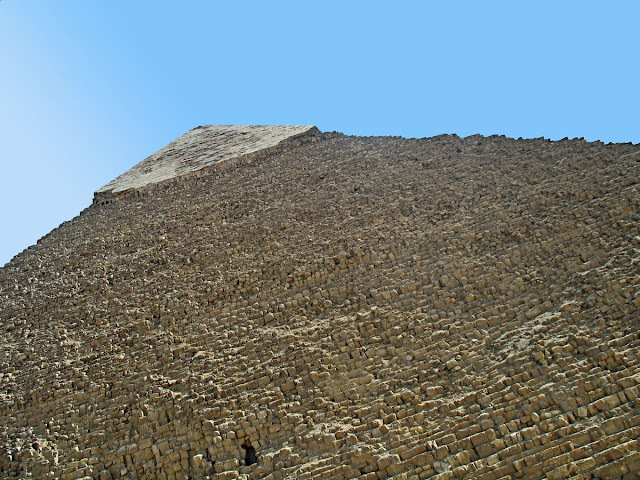 This is another view of the smaller Pyramid of Khafre (or Chephren). To the right of the image is the Great Sphinx. In this photo you have a camel with its caretaker in local dress against a background of the Great Pyramid against a blue sky. An iconic Egyptian visual! This is how the pyramids look like if one looks at them closely. Not surprising to see the erosion, considering how old they are! The smooth upper layer or stone casing is gone and the bricks are visible, many of them broken. 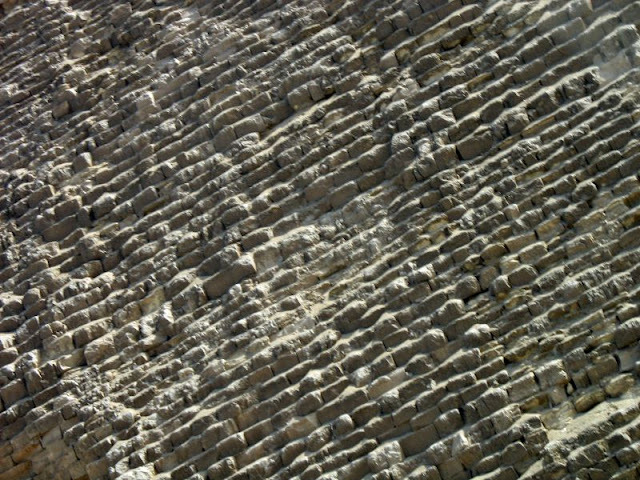 Some of these broken upper layer large stones are visible at the bottom of some of the pyramids. At the bottom of the pyramids there are large boulders which have fallen off. Some of them are possibly from the outer smooth layer of the pyramid. More photos of ancient monuments from Egypt: Temple and statues of Queen Hatshepsut of Egypt or Karnak Temple and Pillar Designs or for more related photos try the label "Egypt"